International Desk: The baby son of a British teenager stripped of her citizenship for joining the Islamic State of Iraq and the Levant (ISIL or ISIS) armed group in Syria has died, according to a spokesman for the Syrian Democratic Forces (SDF). 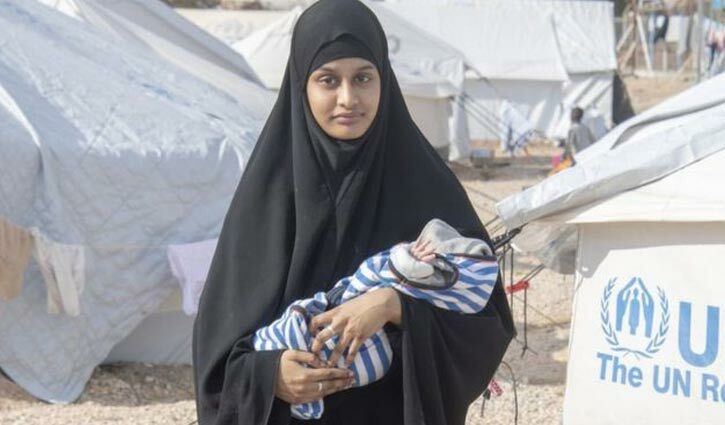 Mustafa Bali was quoted as saying by news agencies on Friday that Shamima Begum's infant had died at a camp in northern Syria. He did not provide any further details. Separately, a paramedic told a news agency that Jarrah, the nearly three-week-old baby, died on Thursday after battling a lung infection. The infant had been suffering from breathing difficulties, the paramedic said. The lawyer representing the family of Begum, Tasnime Akunjee, also confirmed the news on Twitter, after saying earlier on Friday that he had received unconfirmed reports of the baby's death. Begum was discovered last month in a refugee camp in Syria by a reporter with the UK-based newspaper, The Times, four years after she was last seen aged 15 fleeing from her East London home. She, along with two female friends, left the UK to join ISIL in Syria in 2015. Now 19, Begum told journalists she wanted to raise Jarrah in the UK, alleging she had lost two other children in Syria to malnutrition and disease. "I don't really want to stay here, I don't want to take care of my child in this camp because I'm afraid he might even die in this camp," she said in an interview with British broadcaster Sky News shortly after giving birth. The UK government moved to revoke Begum's citizenship, however, blocking her return on the basis she was a dual-national with access to Bangladeshi citizenship. Home Secretary Sajid Javid confirmed Begum's son was a British citizen but said it would be "incredibly difficult" to facilitate the return of a child from Syria. Begum's family has denied she is a dual citizen and said it plans to challenge the UK's decision. A Bangladeshi foreign affairs official had told Al Jazeera Begum is not a Bangladeshi. The case of Begum has highlighted a dilemma facing many European countries, divided over whether to allow ISIL members or sympathisers home to face prosecution or bar them as the group's so-called "caliphate" collapses.